Thrilled we made the right decision about not exhibiting at the NEC National Wedding Show this year. Enquiries and bookings have been pouring in yesterday and today from couples who went to the show and then came home to look for a wedding video company or Marryoke company where we know their venues - and at the right price. We don’t pretend to be the absolute cheapest but we do give exceptional value for money with a top quality product. 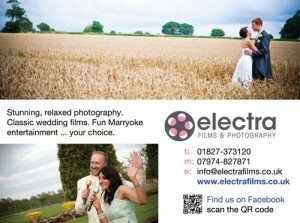 We are also well known for being friendly but unobtrusive filming your wedding. When we do Marryoke too we make sure your guests enjoy themselves without feeling pressured and ... we don’t let your Marryoke interfere with your beautiful wedding either, so relax! We’re happy to chat to you about your ideas or to answer any questions you have from 8am-11pm and we won’t ‘pester’ you either LOL! Your main video DVD includes natural sound throughout and no music overlaid in ceremony or speeches of course. You choose the music. We edit a contemporary watchable film you will enjoy for the rest of your lives. Here’s a recent wedding video highlights. iPhone and iPad viewers need to view YouTube videos using PUFFIN and not Safari as your web browser - it’s a free app. Contact us on 01827373120 8am-11pm for any more info or to talk through your ideas.